I didn't get much accomplished last night because I had a Habitat For Humanity board meeting. But I did manage to get a few rows of the baby sleeve finished. I guess I'll just call this sweater Corie since it's for her. The middle section is kind of puckering. I'm not sure why. I don't think I knit particularly tigh tly but maybe I do. 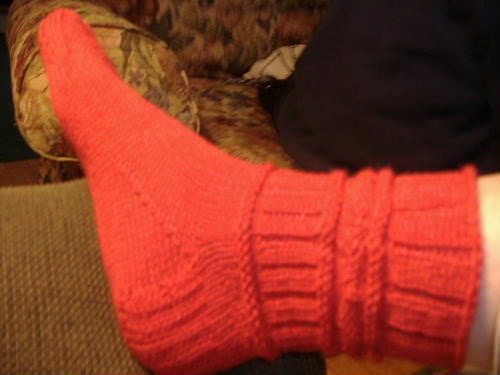 The finished Valentine's sock. I should have made the cuff longer. That will drive me nuts. I SO messed up this pattern. But it wasn't worth ripping out for. It's just my "modified" version. I really like this Paton's Kroy sock yarn... wool and nylon blend. It's the first time I worked with it and I'll use it again. It feels good. 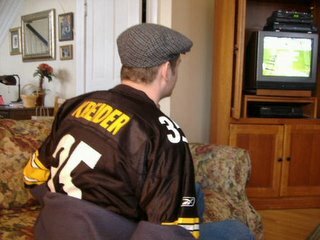 My son.. concentrating on the game on Sunday. I guess you can guess who his favorite player is! Holly...I love Corie and cannot wait to see it on her!! Corie looks great! I'm impressed by how quickly it's coming along, considering all the intarsia. Thanks for the tip on Trellis. 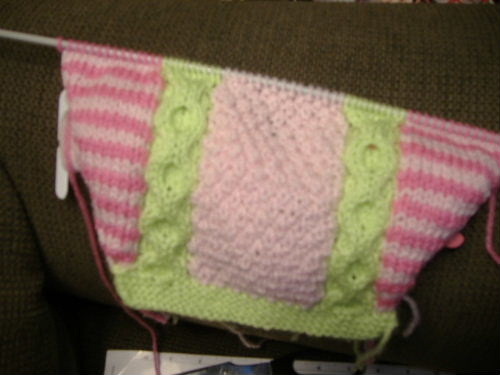 Since the pattern wasn't clear, I tried looking at the pictures to see if I could figure out what was meant to be done with the border. I guess what I thought was supposed to be garter stitch was actually reverse stockinette. That sweater is just CUTE! Such, such, such a beautiful sweater! It's making me want to make something in those colors but I think I'll just live vicariously through you for a bit.